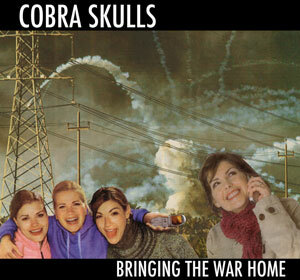 Bringing The War Home is the new five track E.P. From Reno’s boys done good, Cobra Skulls. In addition it is their first release on their new home at Fat Wreck Chords. I hope everyone welcomes them warmly to their new label by going out and buying the disc and supporting them at shows. I’ve been listening the Cobra Skulls for a while now and I like the vibe they are throwing down. They have a sound and a presentation that I truly enjoy. It isn’t overtly aggressive punk, and it isn’t quite hard rock folk. It is somewhere slightly in between while being outside the scope of either. The songs are tinged with the politics of injustice and lash out at perceived ignorance. If I had to marginalize, I’d probably label them something on the order of “roots punk”, but I think the music is accessible beyond the confines of narrow genres. The tracks offered on the EP serve up 4 originals of the variety previously noted as well as a very unique tack on Bad Religion’s I Give You Nothing, done with an interesting blend of rockabilly and something that reminds me of Stepping Stone. At any rate, I love the EP (I’d give more stars, but well, gimme more songs) and you get five tasty tracks in the vein of a few other bands of similar sound such as, Dead to Me, American Steel, Menzingers and The Loved Ones. These bands all have something similar in their sound, and I think is is a strong reminiscence of The Clash: Punk rock with political overtones and a nature that encompasses more than one sound can confine. So maybe forget what I said about “roots punk” I think now I’m going with “Clash-ic Rock”. No, I kid, I kid. I’m not going to say that. Somehow along the way I missed the bus when it comes to Dead To Me. I’m not sure how, but that is in the past now and we don’t have to dwell on it, do we? I can’t help but be curious about the prior LP and EP that I missed, but what if I listen to them and it takes away from how I feel about the new album African Elephants? I think I’ll hold off for now and bask in the glory of what is currently my favorite disc. 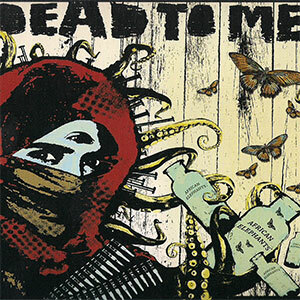 San Francisco punk rockers, Dead To Me, have crafted an album that is at once both familiar, yet novel. The band wears their influences on their sleeve. The Clash, Police, Nirvana, perhaps even Violent Femmes? The effort, however, is far from cookie cutter or pandering to fans of their influences. Instead it is 13 tracks of diverse and unique punk rock. I’m sure I’ve mentioned it before, but there is something about trios. When done right, as it is here, they are a musical powerhouse. Flat out, African Elephants has the guts and sincerity to be a serious contender as one of my all time favorite discs. I don’t know what to say except that perhaps the title of this new NOFX release is far to aptly correct. “The Decline” leaves me a little underwhelmed and a little disappointed. The comedic yet poignant NOFX that I once knew is gone for the moment. I’m not going to give up on them (’cause I didn’t like “Heavy Petting Zoo” either) but here’s the deal a little less art boys and a lot more rock. the CD starts out well enough for the first couple (or what I assume to be) tracks and then it drops right out. I know there are some die hard NOFX fans out there that are gonna be pissed reading this, but then again they’re probably 15. 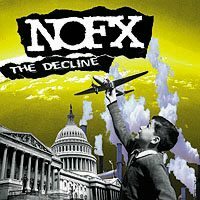 Another thing is that this CD is very politically charged, not this this bothers me, but again it is a departure from what I’ve grown to enjoy from NOFX. I guess it’s good to vent, but get on with it and get back to the good times I have grown to love/loathe.